Do Stocks Suffer When CEOs Use Private Jets? n the past year, there has been a great deal of debate about the special status, accounting policies, and the influence of the Federal National Mortgage Association (Fannie Mae) and the Federal Home Loan Mortgage Corporation (Freddie Mac). The two entities, which enjoy federal government charters and an array of implicit and explicit privileges, have grown into gigantic, publicly traded firms that wield enormous influence on the U.S. capital markets and housing market – and hence on the American economy and the political system. Many national leaders, from Federal Reserve Chairman Alan Greenspan to the heads of large commercial banks, have raised questions about Fannie and Freddie. Have they grown too large and unwieldy? Are they disrupting housing and capital markets? Might they be a future source of systemic risk? And if so, what can be done about them? Answering these questions requires a careful consideration of the companies’ roles and net effects, and some speculation as to what the world would look like if the two were to lose their special status. Fannie Mae, created in 1938, and Freddie Mac, created in 1970, are federally chartered corporations, or government-sponsored enterprises (GSEs). They share narrow federal mandates: to provide finance for single- and multi-family housing. And while they are both publicly traded companies, at each company, five of the 18 directors have been chosen by the President, and the two companies enjoy an array of special privileges. Fannie and Freddie are the only two enterprises that have received this special housing finance charter from the federal government. Both companies have grown rapidly in the past two decades, as the data in Table 1 indicate. As of year-end 2003, Fannie and Freddie had $1,010 billion and $803 billion in assets, respectively. Ranked by assets, they were the second- and third-largest “private” enterprises in the U.S. In addition, there are about $1,300 billion outstanding pass-through mortgage-backed securities (MBSs) that carry Fannie’s guarantee, and $769 billion guaranteed by Freddie. With market capitalizations of $75 billion and $43 billion, respectively, as of early 2004, Fannie and Freddie ranked among the 60 largest publicly traded companies. he companies have been able to grow so rapidly in part due to their status as GSEs, which confers several advantages that rivals don’t enjoy. Although their prospectuses explicitly note that the government does not guarantee the securities they issue, the securities markets act as if the firms’ directly issued debt and MBSs may well carry a federal guarantee. Fannie and Freddie thereby enjoy lower financing costs than do AAA-rated corporations – but not quite as low as the U.S. government itself. The two firms are subject to lower capital (net worth) requirements for holding residential mortgages in their portfolios than are banks and thrifts, and are exempt from state and local taxes. Their securities are exempt from the Securities and Exchange Commission’s registration requirements and fees. They can borrow from the U.S. Treasury and use the Federal Reserve as their fiscal agent. Their MBSs, when held by U.S. banks and thrifts, carry a capital (net worth) requirement of only 1.6 percent, rather than the capital requirement of 4 percent that the underlying mortgages themselves would require if held by a bank or thrift. Fannie and Freddie are also subject to major limitations. They are restricted to the business of providing residential mortgage finance; they cannot originate mortgages. They can only finance mortgages that are at or below a specified maximum (“conforming”) loan size that adjusts annually with an index of housing prices (in 2004 that limit is $333,700 for a single-family home), and the mortgages must have a 20 percent down payment or have a third-party credit enhancement, such as mortgage insurance. The U.S. Department of Housing and Urban Development (HUD), as well as HUD’s Office of Federal Housing Enterprise Oversight (OFHEO), regulates the companies. The GSE status of Fannie and Freddie gives them clear advantages over non-GSEs. Because of their “agency” status, Fannie and Freddie can issue debt at interest rates that are about 35-40 basis points less than could an otherwise similar non-GSE. Their MBSs similarly carry a yield that is about 30 basis points lower than non-GSE MBSs. On the other side of the ledger, Freddie and Fannie’s mortgage purchase activities appear to have reduced conforming mortgage interest rates by about 25 basis points. The companies’ participation in the residential mortgage markets takes two forms. First, they buy and hold residential mortgage assets in their own portfolios; they fund these purchases overwhelmingly with debt. Of Fannie’s $1,010 billion in assets at year-end 2003, $902 billion (89 percent) was invested in mortgage assets; of Freddie’s $803 billion in assets, $660 billion (82 percent) was in mortgage assets. Their liabilities were composed of 96-97 percent debt and only 3-4 percent equity. econd, they purchase residential mortgages from originators, create securities (MBSs) from bundles of the mortgages, and swap the securities back to the originators or sell the securities to investors, with guarantees on the mbss as to the timely payment of interest and principal. By doing so, Fannie and Freddie have created a large national secondary market in residential mortgages and revolutionized the mortgage market. A few decades ago, mortgage finance was largely a vertically integrated process. Banks and thrifts originated residential mortgages, which were financed almost entirely by deposits, and kept the mortgages in their portfolios. Federal deposit insurance, provided by the Federal Deposit Insurance Corporation (FDIC) to banks and the Federal Savings and Loan Insurance Corporation (FSLIC) to thrifts, provided guarantees to the depositor/liability holders. The activities of Fannie and Freddie have created a second, vertically disintegrated process. Banks still make mortgages, but they frequently sell them to Fannie and Freddie. Banks and thrifts also purchase MBSs and hold them in their portfolios, thereby gaining a more liquid mortgage asset with a credit guarantee and lower capital requirements, and the potential for greater geographical diversification than could be achieved from local mortgage originations. 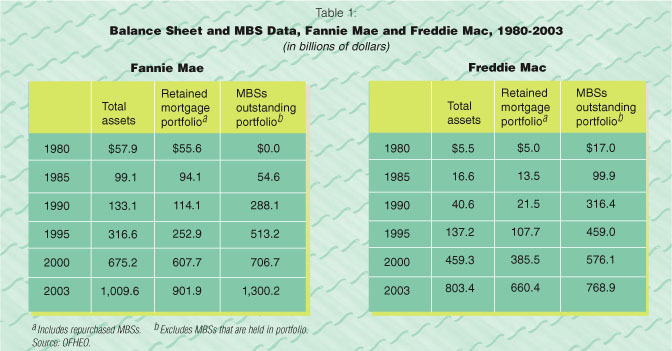 As of year-end 2000, Fannie and Freddie’s mortgages-in-portfolio plus MBSs outstanding together accounted for the following percentages of the various categories of residential mortgages: 39 percent of the $5.6 billion total of all residential mortgages; 40 percent of the $5.2 billion total of all single-family (one-to-four units) mortgages; 48 percent of the $4.4 billion total of all single-family “conventional” mortgages (that were not insured by the Federal Housing Authority or the Veterans Administration); 60 percent of the $3.5 billion total of all single-family conforming mortgages; 71 percent of the $2.8 billion total of all fixed-rate single-family conforming mortgages. Fannie and Freddie are exposed to at least three types of risks. First is credit risk. On all of the mortgages that they hold in their portfolios and on all of their MBSs, Fannie and Freddie are exposed to the risks of default by the mortgage borrower. Second is interest rate risk. On all of the fixed interest rate mortgages that they hold in their portfolios, Fannie and Freddie are exposed to the risk that interest rates will rise, which will decrease the value of their assets. Further, the risks are asymmetric: Since all mortgage holders have the option to pre-pay, interest rate decreases are often accompanied by waves of pre-pays and refinancings at lower interest rates. As a result, Freddie and Fannie do not experience comparable capital gains. Third is operational risk. This is the risk of poor management, bad judgments, and employee fraud. As would be true for any well-managed company, Fannie and Freddie take extensive measures to contain these risks. But if the capital markets are correct in their belief that the federal government would stand behind Fannie and Freddie’s obligations in the event that either were in financial difficulties, then creditors need not worry about suffering huge losses. Instead, the federal government is at risk. In essence, then, the implicit guarantees that Fannie and Freddie enjoy comprise a contingent liability, or implicit cost, for the federal government – for 2003 the annualized figure was around $13 billion. The size of this contingent liability depends on external factors, such as the volatility of interest rates and homeowner defaults, and partially on internal factors, such as the size of the companies’ securities issuance and the quality of their hedging. But the government only recognized the need to limit its exposure through heightened regulation of the companies in 1992, when Congress established core capital requirements for Fannie and Freddie and created OFHEO within HUD to set capital requirements and conduct formal examinations of Fannie and Freddie. The evaluation of the net or balance of Fannie’s and Freddie’s roles must be made in the larger context of housing policy in the U.S. The government puts great store in boosting the percentage of households that own their own home. That figure is seen as an important social indicator. In the fourth quarter of 2003, it stood at a record 68.8 percent. In the 1990s, the goal of extending home ownership deeper into the ranks of “low- and moderate-income” households became more important. And so in 1992, Congress gave HUD the power to set goals for Fannie and Freddie to extend their mortgage purchase efforts to encompass more low-and moderate-income households. There are serious theoretical arguments to support the claim that home ownership provides positive externalities (spillover effects) for society and thus to support the encouragement of home ownership, and a recent body of empirical research has begun to validate those arguments. Owners tend to maintain their homes better than do renters, and are more likely to become more involved in their communities. Also, home ownership has traditionally been an important vehicle for household saving and asset accumulation. But there clearly are limits. Because of the substantial transactions costs in buying and selling a home, as well as the inherent riskiness of a home as an investment, home ownership may well be inappropriate for households with high mobility, unstable employment, and irregular incomes. s a result, it would seem that the best program would be a focused one that encourages those households who would not otherwise buy (but for whom it is a close call) to purchase a home. This focus should be on would-be first-time low-and moderate-income household buyers. But virtually all of the policy tools used to encourage home ownership, including the basic Fannie/Freddie program, are quite broad and blunt. So our society effectively spends a great deal of time and resources subsidizing home ownership for households – especially middle-and high-income households – who would buy and own anyway but who are thereby encouraged to buy larger and better appointed homes and to buy second homes. That the panoply of encouragements causes the stock of housing to be inefficiently larger than would otherwise be the case is evident. Northwestern University professor Edwin S. Mills in 1987 estimated that the U.S. housing stock was about 30 percent larger than if the encouragements were not present. With an excessively large housing stock (and insufficiently large stock of other productive capital), he found that U.S. aggregate income was substantially lower – about 10 percent – than it otherwise could be. More recent studies have supported that finding. Fannie and Freddie borrow for less than would otherwise be the case. They cause conforming mortgages to cost/yield less than would otherwise be the case, thereby increasing the demand for residential housing. And they create a contingent liability for the federal government. Is it worth the price? We should start by assuming a zero-sum world and then look for positive externalities that would justify the special government treatment that Fannie and Freddie receive. While GSEs do lower the cost of home ownership modestly, most of the encouragement they provide must be to induce households who would be owner-occupiers anyway to buy a bigger/better appointed house and/or to buy a second house. In 2002, when the Fannie/Freddie conforming mortgage limit was $300,700, the median sales price for a new home was $187,600 and the median sales price for an existing home was $158,100. The median 80 percent mortgages would have been $150,080 and $126,400. Thus, Fannie and Freddie are financing many homes that are far above median levels. As a result of legislation passed in 1992, HUD was instructed to set specific goals for Fannie and Freddie to help create more affordable housing. The GSEs were to focus on low-and moderate-income borrowers, households with less-than-median incomes, and to focus geographically on underserved areas such as low-income and high-minority census tracts. Over the course of the 1990s, Fannie and Freddie met these goals. But the extent to which these efforts have induced Fannie and Freddie to expand home ownership, beyond what otherwise would have occurred, is unclear. Detailed studies indicate that the targets may be sufficiently broad so that meeting them is not a strain, and that these GSEs’ efforts with respect to low-income households and areas tended to lag behind those of local portfolio lenders. What’s more, such efforts to lean on Fannie and Freddie to make loans involve placing pressure on an organization to take actions that are believed to be unprofitable, and that thereby rasp against the grain of a profit-seeking enterprise. 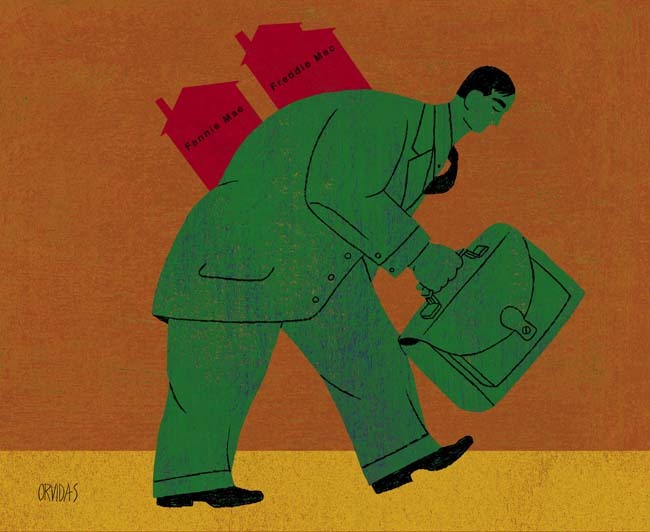 Observers have noticed two other potential advantages from the government chartering of Fannie and Freddie. First, Susan E. Woodward of Sand Hill Econometrics has argued that the (implicit) government guarantee permits Fannie and Freddie to issue a blanket guarantee on all their MBSs that removes issues of credit risk from the minds of MBS investors. And that eliminates the transactions costs of credit/information research in which MBS investors would otherwise engage. While this argument is surely correct, the gains are likely offset by the contingent liability of the federal government, as well as the monitoring costs of OFHEo. he other potential positive advantage arises in the context of Robert Van Order’s model of “dueling charters.” Van Order, the former chief economist at Freddie Mac, reminds us that depositories that fund residential mortgages and hold them in portfolio also have a government guarantee, in the form of federal deposit insurance. If the depositories are inherently a less (socially) efficient means of financing mortgages than are the GSEs, then the expansion of the GSEs at the depositories’ expense reduces social inefficiency. However, though the innovation of mortgage securitization has clearly revolutionized mortgage finance and would persist even without the favored status of the GSEs, the assumed inherent superior efficiency of Fannie and Freddie may not be valid. Thrifts are likely holding more MBSs today because the MBSs enjoy regulatory advantages when it comes to meeting capital requirements. In sum, the positive externalities and thus true social benefits provided by Fannie and Freddie are surely positive but modest. If the status of Fannie and Freddie could be considered in isolation, the policy recommendation to privatize them – i.e., remove all explicit/formal and implicit government support – would be an easy one. Given their substantial brand-names and their impressive collection of human and intellectual capital, they would likely continue to innovate and prosper, with their relative funding costs a bit higher than is currently the case, their MBSs yielding a bit more, and the costs for home buyers of obtaining a residential mortgage rising a bit. Freed of the restrictions that accompany their current status, Fannie and Freddie would likely vertically integrate into related areas, such as mortgage and title insurance, and expand horizontally into related areas of finance, such as auto loans and jumbo mortgage loans. And in turn, the government’s contingent liability would disappear. In their place, the federal government should institute a targeted program to encourage home ownership for first-time buyers among low-and moderate-income households. This would be a far more direct way of addressing the positive externality of home ownership. The encouragement should apply both to reducing down payments and interest costs. The costs of the program would, and should, be explicit. Further, as a way of reducing the costs of housing more generally, governments at all levels ought to focus on supply-side considerations such as modifying restrictive land zoning (which reduces housing supply by limiting the ability to build single-family houses on small lots and limits the building of multi-family units), modifying building codes that unnecessarily raise housing costs without adding to housing safety, and avoiding restrictive international trade policies that raise the prices of important inputs into housing, such as lumber. general rationalization of U.S. housing policy may well be a quixotic goal, however. Public and political sentiment shows few signs of turning away from the notion that more housing is always a good thing, even if middle-and high-income households are the primary beneficiaries. If privatization of Fannie and Freddie is not a realistic political option, then rigorous and vigorous safety-and-soundness regulation must be pursued, so as to minimize the federal government’s contingent liability. But so long as the GSEs exist in their current form, the goal of expanding home ownership will be pursued only indirectly as part of a larger mosaic of programs, subsidies, and tax breaks. Disentangling Fannie and Freddie from that larger framework will not be easy. But it is a task that is worth attempting. Lawrence J. White is Arthur E. Imperatore Professor of Economics at NYU Stern, and was a board member of the Federal Home Loan Bank Board from 1986 to 1989, in which capacity he was also a director of Freddie Mac.